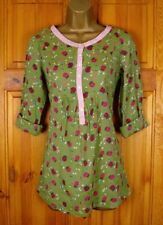 Ladies Monsoon Blouse Size 18. Condition is Used. Dispatched with Royal Mail 2nd class. 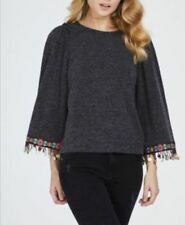 This is a really lovely blouse with a lovely pattern on the front and nice shaped sleeves. There is a slight line in the material which is part of the material and not anything i did but just wanted to say (see pic) but does not spoil the top in any way. In a lovely lightweight material ideal for the summer. I always obtain proof of postage so will not be held responsible for items that go missing in the post. Thank You For Looking. womens Bardot criss gross sleeve top, primark, good condition, size 12. women’s criss cross sleeve T-shirt top, boohoo, good condition, size 12. Both khaki green in colour. Condition is Used. Dispatched with Royal Mail 1st Class. Ladies Savida. b lack top. length 2 4”. waist 1 5”. 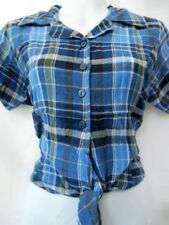 Ladies blouse from Next - size 18. The front is cream and the back is grey. The 3/4 length sleeves have a cream cuff. Covered button front fastening. Mock front pocket with flap. Small side seam slits. Ladies Mistral Top Size 10, blue with 2 front pockets. Condition is Used. Dispatched with Royal Mail 2nd Class. Pretty pale blue patterned blouse from marks and spencer size 18. Condition is Used. Dispatched with Royal Mail 2nd Class. Lovely for spring / holidays. _gsrx_vers_841 (GS 7.0.16 (841)). Don't miss ! Worn once, excellent condition. _gsrx_vers_841 (GS 7.0.16 (841)). Don't miss ! Apologies for any inconvenience. Lovely ladies Next size 10 flowery blouse. Tropical floral Flare bell sleeve blouse. by ATMOSPHERE. Size 12 UK / 40 EUR. 69cm full length. 100% Polyester. Beaded front fastens with four fabric-covered buttons. 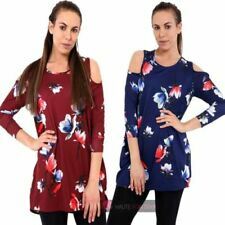 Looks great worn with leggings, skinny jeans or denim shorts. Wash inside out/ Iron on reverse. Front Panel: 98% Nylon 2% Elastane. Lining: 100% Polyester. A beautyfull cream short sleeved pretty lace style top with. up or down. WAREHOUSE BRAND NEW DARK GREEN BLOUSE Hi this garment was purcased from Warehouse in Birmingham. I never tried this garment on as a busy Saturday afternoon and unfortunately does not suit me! It is a stunning blouse the photos do not do it justice,ideal too team up with trousers and heels!!! It's new season stock the top half is sheer and folded over at sleeve ends. A beautiful blouse/Top. The shop I purchased from is a too far too return therefore the reason for selling it on here, so grab yourself a bargain!!! R.R.P £24.00 ..Grab yourself a Bargain!!! Thankyou For Looking!!!! Worn once (max) M&S stripes shirt size 16. Is quite heavy due to amount of beads. Blouse size 14 by Love Label. Main colour black plain at the back and heavily beaded at the front with white shapes in what feel plastic but the label describes as shell and gold sequins. Marks and spencer Per Una. Ladies blouse size 18. having a clear out of things I don't wear any more. Boohoo Cropped Crushed Velvet Skater Detail Size 14. Ruffle Fronted Blouse Top. Lovely Ladies Per Una Pink Floral. 100% polyester. Anne Cambell pink shirt. length 22". arm pit to armpit 20". Women blouse, brand ''RIVER ISLAND'', size 12, color black. 5 out of 5 stars - Women blouse, brand ''RIVER ISLAND'', size 12, color black. 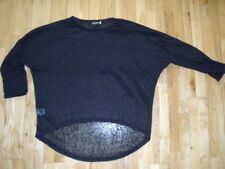 1 product rating1 product ratings - Women blouse, brand ''RIVER ISLAND'', size 12, color black. Warehouse Striped Blouse, Size 16. Condition is used. Great condition! Lovely black and white pinstripe blouse with button fastening. It also has buttons at the bottom of the blouse on either side, a lovely extra detail. A lightweight fabric, it is perfect to wear for any smart occasion, under a blazer or jacket, or just on its own with jeans. Very pretty Monsoon size 8 blouson type blouse. Only worn once so excellent condition. Main colour orange flowers & purple as seen in photos. Sheer top so would probably need a vest top underneath. Sweet lightweight top with cap sleeves. Wallis large top t4_16.black and green. 3/4 length sleeves. In good condition. JUST ELEGANCE BLUE POPPY BLOUSE WITH ROUCHED KNOT DETAIL -UK18- EASY WEARING!